Meet Diego Terzano, our October 2018 #DryTortugas Photo Contest winner. We had the chance to ask him a few questions about his experience at the Dry Tortugas National Park. Read on to learn how he captured his amazing photo! I arrived at Dry Tortugas on August 24th for a 2-night camping adventure with a friend of mine on the Yankee Freedom. It was terrific! The journey was smooth and the ferry was very comfortable and spacious, breakfast was quite convenient and welcomed. The staff was very polite and educational throughout the trip. Since I camped, I had the opportunity to take gorgeous sunrise and sunset images of Fort Jefferson and the beautiful surrounding scenery and wildlife. 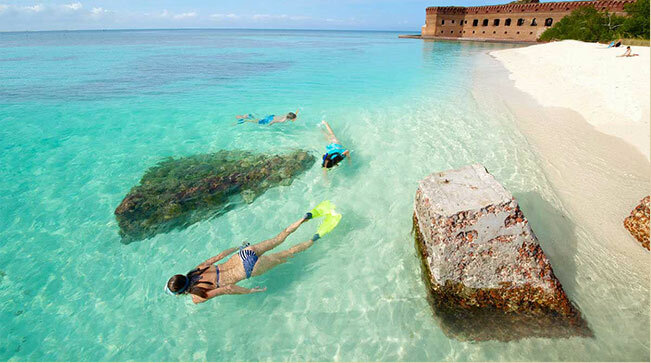 I highly recommend camping to anyone visiting Dry Tortugas to fully appreciate everything it has to offer. However, I have already seen some amazing images of Garden Key and wanted to see if I could capture something a bit different. We took a tandem kayak on the Yankee Freedom and my friend and I decided to row the 3 miles out to Loggerhead Key one morning. It was a great experience, we capsized in the process (dry bag was a savior) and got quite sunburned but we got rewarded with stunning beaches, unforgettable views and a desolate island that for a moment felt like our own private retreat. When I took the image, I felt like I earned it and the journey was worth it. The sky was dramatic, the wind was blowing and the lighthouse was simply there, grand and imposing, showing its signs of age but standing tall despite the adverse conditions it faced over the years. I used a Sony RX100 III that has a 24-70mm lens. The pass could not have arrived more timely. My wife and I are planning a trip to Zion & Death Valley National Park for Spring 2019 and possibly a return trip to Dry Tortugas for the day!